Roseau, Dominica – April 7, 2008……… After a wait spanning nearly five decades, villagers of Rosalie and Petite Soufriere may not have to wait too much longer for the start of construction of the much anticipated Petite-Soufriere to Rosalie link road. Prime Minister, Hon. Roosevelt Skerrit has given a commitment that Government will construct this vital road, expected to cost in the region of EC$12 million ECD. On Friday, April 4, 2008, Prime Minister, Hon. Roosevelt Skerrit led a team of Cabinet Ministers along with technicians from the Ministry of Public Works and Infrastructural Development on a 3 mile walk from Rosalie to Petite Soufriere two (2) villages in the Castle Bruce constituency. “We have been able to raise some funding to go towards that road. The road in its entirety will cost in excess of EC$12 million ECD so it is a matter for us now to sit down with the Ministry of Public Works as a Cabinet and the villagers to work out a schedule and timetable for the implementation of this very important project. We are committed to bringing this road to fruition sooner rather than later and we are very pleased that it is a Labour Party Government that is always prepared to listen to the needs of the people, particularly in the rural communities,” Prime Minister Skerrit told the media. The Prime Minister added that Government does not have all the resources to build the road “in one go” and so the project will be undertaken in phases. According to Chief Technical Officer in the Ministry of Public Works and Infrastructural Development, Mr. Petronald Green, the project is simple and feasible. A feasibility study and final designs have already been done on the proposed road. All that has to be done now is the identification of financial resources to construct the road, Mr. Green added. The road will be a two-lane road, with concrete drains and proper drainage structures and concreting the steep sections, with proper guard railings and protective measures. The European Commission funded the cost of the feasibility study and the final designs on the Petite-Soufriere -Rosalie link road. The construction of this road is expected to open up new opportunities in tourism and agriculture. 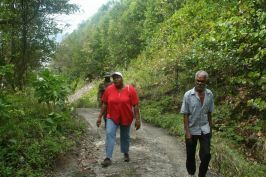 The construction of a road to link the villages of Rosalie and Petite Soufriere has been talked about since 1949. Parliamentary Representative for the Castle Bruce constituency, Hon. Loreen Bannis-Roberts and Minister for Public Works and Infrastructural Development, Hon. Ambrose George also walked the 3 mile route.